In our first match as just Serie A contenders, it will be important to send a resounding message to Fiorentina and to the rest of the league: We are the Champions, and we will eat you for breakfast. (The breakfast part may just be because the game is on at 6 am for me here, sorry.) In short, this Easter Saturday, we will need to become one-eyed, one-horned, flying purple people eaters. But whatever with Fiorentina, guess who should be in the squad for this match? CASSANO!!! That's right, everyone is anxious for the return of Fantantonio. Since his stroke and subsequent heart surgery at the end of October last year, one of our very best players has been sorely missed in the hearts of fans and on the pitch. And while he has been easing back into training since January, I sincerely hope Allegri does not have a 90 minute welcome back planned for him. I call that "the Allegri Special," which has so far been given to Thiago Silva, and also Pato more than once this season. We want to see that smile back on the pitch where you belong! Speaking of Pato, as of this writing, I have not heard anything definitive on him. News headlines are claiming his season is over, but honestly, no one seems to know what is going on with his injuries, and it is a shame that he has come under such intense scrutiny simply for being injured so much. I am disgusted at fans who curse him and blame him for getting injured, as if any player would intentionally do that. He clearly wants to play, as do all footballers, and I stand by him 100% and hope that some explanation is found, as well as a way to stop/prevent future injuries. As for more injuries, Gamberini is out for Fiorentina, and Amauri is in doubt. A shame about Amauri, since the big Brazilian forward hasn't scored in any of his 10 appearances so far for Fiorentina. We could use a guy like him on the pitch, he takes any team down to 10 men when he steps out on it. Montolivo and Cerci are also suspended, so la Viola will be stretched a little thin when they come to the San Siro. Good coach, good team... bad luck? 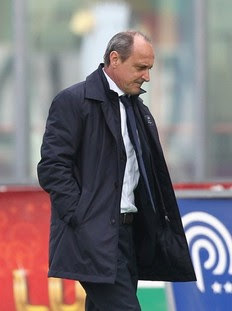 Coach Delio Rossi faced Milan in Florence in November as his first match in charge of Fiorentina. When he started, they were 13th in the table, now they are 5 points above relegation in 17th. With all of the sacking going on this season, one would think Rossi would have been amongst the victims by now, but I think they realize that there isn't anyone better out there to replace him with, and the season is in its final 5 weeks. But they are coming off of a D-L-L-D-L record, including that 5-0 trouncing Juventus gave them at home a couple of weeks ago. I can't imagine their confidence is exactly burning strong. However they do have players like Jovetic and Behrami and Juan Vargas who can make a difference in the blink of an eye, and the team will be desperate to avoid relegation and needing every point possible to survive. Last week in their home loss to Chievo Verona, Rossi lined up Boruc; Natali, Gamberini, Pasqual, Cassani; Montolivo, Behrami, Vargas, Marchionni; Amauri, and Jovetic. Obviously, he is going to have to replace the injured & suspended players, but he still has players available like De Silvestri, Kharja, Lazzari, Ljajic, etc. Allegri still has a few injuries, but is closer than ever to having nearly a full squad at his disposal. A guess at who he'll line up to face the purple people: Abbiati; Abate, Mexes, Nesta, Mesbah; Aquilani, van Bommel/Ambrosini, Nocerino; Boateng; Ibra, Robinho. I'm sure he'll surprise us, but that's who I'd go with. I haven't heard anything one way or the other on van Bommel, but would expect him to play to give Ambrosini a break if possible. And would love to see Cassano make a cameo late in the game and score a goal for good measure. Milan cannot drop a single point if we are to guarantee our Scudetto. We need a perfect 8/8 wins to close out the season, unless Juventus decide to drop more points, which they show no signs of doing. But Fiorentina are fighting for their Serie A lives, and I'm willing to bet Delio Rossi is fighting for his job, too. Our last meeting was a disappointing 0-0 draw, so I know both teams want to see some goals in this one. As much as I would gladly join in the mercato fray to sign players like Jovetic on the cheap should Fiorentina be relegated, part of me would feel like Serie A would be losing yet another storied team, and Serie A has done enough changing lately for me. Still, I must put my team before nostalgia. Fiorentina can gain points elsewhere, I want 3 points and a clean sheet against them on Saturday. Not only are Milan the best club in Serie A on the pitch, we have the best Scudetto celebrations, too. So even if it means that we must become one-eyed, one-horned, flying purple people eaters on Saturday, I am okay with that. Tequila.